For many, Parasite Inc. seemed to come out of nowhere with the excellent Time Tears Down back in 2013. While it stayed within the confines of the melodic death metal range, it was such a well done release that one couldn’t help but gravitate towards it. It was simply a fun and infectious album, and one that kept the aggression intact, while injecting hooks aplenty. But then there wasn’t much news from the German act for quite some time. Enough that some may have even written the band off as being finished. But now in 2018, we are looking at the follow-up to Time Tears Down with Dead and Alive. The band went the crowdfunding route earlier in the year to help reduce their recording costs, and the album has now been released to the public. 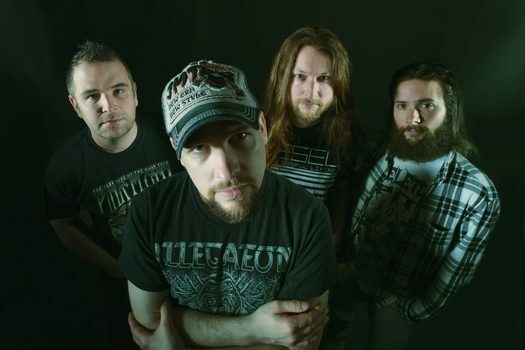 An increase in dynamics, yet still a firm stickler to what makes the genre great, Dead and Alive will please long-time fans as well as newcomers who dig melodic death metal. We were able to chat with vocalist/guitarist Kai Bigler about all of these topics and more below, just prior to the album’s release in mid-August. Dead Rhetoric: What were some of the hurdles that you had to overcome in the time between Time Tears Down and Dead and Alive? Kai Bigler: That might take a while [laughs]. I think that first, we were not prepared for the success of Time Tears Down. Once we had finished the album, we were not prepared for the tasks that followed the release. Things like shipping out the orders – we suddenly started to sell cds, and when we had finished the album, we only had cds and people were requesting different types of merchandise. We were at shows, just selling cds and people were like, “Why don’t you sell any merchandise?” We were not prepared for the success of the album itself. Another thing was that when we finished, first our bassist quit the band, then our second guitarist quit as well. It was three or four months after the release. That was kind of a disaster for us. We were ready to start, then the line-up was broken. We had some struggles to find replacements. It was a difficult time for us. It took us a year and a half to sort all this stuff out and we were ready to get back into the songwriting process. We don’t do this full time – we work 8 hours and then it’s another 8 hours of band work. It kept us away for a long time now, but we finally started working on Dead and Alive in 2015. Dead Rhetoric: How do you think you have advanced your sound in this time? Bigler: I don’t think we changed too much. We just balanced the instruments differently and gave the keyboards more room. For the first time, we used them as a leading instrument, like in “Once and for All” in the chorus, the keyboards took over the main melody. I think we made the songs with more variety. There are more slow songs, and they have more contrast. I’m not sure how other people will view it, but for us, we feel there are more facets in the songs and have better songwriting. Dead Rhetoric: I would agree – I remember hearing Time Tears Down when it came out and there’s some clear changes in dynamic on this one. I actually wanted to talk about two of the songs, “Headfuck Rollercoaster” and “Sunset Overdrive.” I think those seem to represent two sides of the band, being more aggressive and more melodic. Bigler: Actually, “Sunset Overdrive” was a relief for myself. I had been working on making all of the songs aggressive and heavy, and “Sunset Overdrive” was a nice contrast for myself. It was something more fun, and not to be taken too seriously – not thinking too much about all the elements in the songwriting. Dead Rhetoric: What made you decide to go the crowdfunding route for Dead and Alive? Bigler: When we made Time Tears Down, we had saved some money and at the time, we pressed around 1000 copies and we were done. Over the years, we have grown and the production for Dead and Alive needed to be more advanced and complex. So it required more money to do the production in general. We couldn’t manage that on our own. We did not have a label at the time, so crowdfunding seemed the obvious way to go – to let the fans help us in getting this album out. Without it, I don’t think we could have made it at all. I think it worked out pretty well. We had set a goal for 10,000 euros, but we reached about 16,000 thanks to PayPal. I don’t understand why all the crowdfunding platforms have abandoned PayPal as a payment. A lot of people use it, and we actually only raised 8,000 on Indiegogo itself, but around 9,000 on PayPal. We were lucky to do that – it helped us a lot. Bigler: Yes. We took that money to make the videos and to make the shirts. Additionally, we made an extra cd of demos and unreleased songs, which will be delivered to the backers. I think that’s a pretty cool deal, for the money they gave us. The album, Dead and Alive, was very much influenced by the fans. Dead Rhetoric: There’s a cover of Scandroid’s “Empty Streets” to end the album. What did you like about the track that made you decide to cover it? Bigler: I felt like it had that punk attitude that I thought it would work with guitars and some gang shout choruses. I was just fooling around in the rehearsal room but it turned out pretty well. I told the other guys to try it in the rehearsal room and they did – it was a lot of fun, so we couldn’t resist putting it onto the record. Dead Rhetoric: You mentioned this earlier, but what do you view the function of the keyboards to be in a band like this? Bigler: It’s a bit of a struggle between myself and Benjamin [Stezler], our drummer, because he doesn’t like the keyboard elements as much. I would go much further with the keyboards, so we meet somewhere in the middle. I think that defines the sound of Parasite Inc. I’m not sure how we will go in the future. When we started out as a band, we wanted a keyboard player, but didn’t find one. The first songs didn’t have keyboards, but we always wanted to include them as a supporting element. During the time of Time Tears Down, we had the possibility with backtrack players to use the keyboards live. With that possibility, we aren’t afraid more of these elements to the songs. I think they are a good part of our music. Dead Rhetoric: What can you say about the cover art? I read elsewhere that it took about 300 hours to make it. Bigler: Yes, we have an animated version of the artwork. That took around 300 hours to render. I think the artwork itself took about 5-6 hours if I remember correctly. The idea was that we wanted to visualize the status of the band, as we did with Time Tears Down. Over the last 5 years, we were constantly busy with working for the band, but from the outside, people didn’t see all that work. Some people started to ask us if we were even doing another album or if we were alive. So we felt alive and others felt that we were dead. 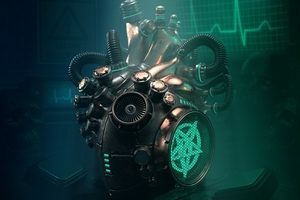 That’s the story behind it, so we came up with the idea of using a mechanical heart, which represents the band. We added defibrillators because you can kill the heart or you can bring it back to life. You can set both states with them. We even integrated some elements from Time Tears Down into the heart as the gears and the fan that you can see on the heart. That’s part of the cover of Time Tears Down. We try to evolve our artwork to the state of the band itself. Dead Rhetoric: What do you like about melodic death metal in general? Bigler: I like the mix between the melodic elements and the aggressiveness/heaviness. I think it was always something that fascinated me with the music. You have some metal styles that are very technical, and some are too melodic. Bands that sound nice, but I want some aggression and heaviness. I think melodic death metal is a good combination of everything that metal has. You can be technical, you can be melodic, and you can be aggressive. You can mix all of those elements. That’s why I like melodic death metal. Dead Rhetoric: Any bands, outside of your own, that you feel are doing it right at the moment? Bigler: There are quite a lot I think [laughs]. You have the big ones, like Children of Bodom and Arch Enemy but there are quite a few smaller bands. Bloodshot Dawn for example, I’m a big fan of them. I also like a band from Japan called Serenity in Murder. There are more, but I can’t think of too many off the top of my head. Dead Rhetoric: You mentioned that everyone in the band is doing work outside of the band. What do you all do for a living? Bigler: I’m a web designer, so I mostly do home pages and some artwork designs for bands. Stefan [Krämer] works at a car rental dealership. It’s cool for us because it’s easy to rent buses for touring. Dominik [Sorg] is the only one in the band who has a good income. He works at city hall, but I’m not sure what he actually does there. I just know he’s kind of rich compared to us [laughs]. Benny is also self-employed and he does music libraries for companies. They do virtual instruments, so you can play a guitar on keyboard and it sounds like the real thing. It’s recording software, and he has been working for Big Fish Audio in LA for a while, but I’m not sure what he’s actually doing now. Dead Rhetoric: Once the album comes out, what are your plans for the fall and winter? Bigler: After the album comes out, we are preparing for our release tour in October. We have a few shows here in Germany, and we have some summer festivals – we are going to play 3-4 more. Then we will see what comes next year. I hope we will get some touring offers. It’s a bit difficult. People ask us all the time to come to the US, Finland, Denmark, or the UK, and we want to see how we can make it possible. Dead Rhetoric: It’s tougher for a smaller band to kind of get that momentum going at first. Bigler: A friend of mine is playing for the band Cytotoxin. I saw him at the end of last year and he mentioned that they were planning on doing a US tour and he told me about the prices for a working visa. I said, “Ok, we will never make it to the US.” They are really expensive. I think it was around 1,000 euros per visa. That’s quite a sum of money!